If you have ever had to add a frame around your text and then have had to edit that text and re-adjust or even recreate the frame, today’s tip will help save you the time from having to edit both the text and frame by simply editing the text. The following tip has been tested successfully with AutoCAD 2013 and 2014. AutoCAD 2011 doesn’t have the controls to make this tip work as easily and adjustable and I don’t have a way to test this tip in AutoCAD 2012. Open the MultiLeader style dialog by entering MLS <enter> in the command line or by clicking on the diagonal arrow in the bottom right of the “Leaders” oanel of the “Annotate” ribbon. Set the desired text style and heights to your new multileader style and make sure to apply the check mark next to “Frame text” under the “Content” tab. This applies the frame around your text that automatically adjusts. 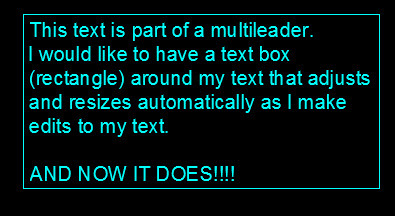 Double click inside of the Multileader to activate the “Text Editor” contextual ribbon tab. Also notice that the offset distance of the background mask is controlled from this dialog box. This entry was posted in Leaders, Text, TIPS, Uncategorized. Bookmark the permalink. Instead of creating the leader then deleting it, why not just set the ‘type’ in Leader Format to “none”? Now if it would just mask I’d be thrilled. shrug.. I updated the post that shows the steps to add the background mask to the multileader text. Hi! Your tip helped a lot. In autocad 2011 it takes a few more clicks but still better than the alternative. THANKS!! I have trouble adjusting the offset of the textframe (border around the text). There seems to be no control over the distance this frame has to the text. As It is now it’s way too close. Sorry. 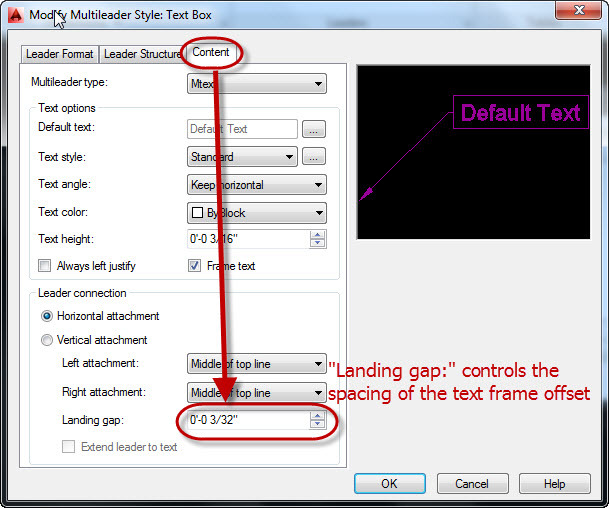 After a bit of reading I learned that the “landing gap” setting does control this, but only in version 2012 or higher. I’ve tested this tip in AutoCAD 2012 and it works there as well. 2012 included the ability to both remove the leader or set it to none in the style definition. Agree with others – this is a very cool tip! Hi Greg, Nice blog you have here. Can you please help me with this cad problem of mine. I want my text to rest on a poly curve line. If the line curve upwards, my text should also curve going to upward direction. Is this possible? Thank you. I’m happy that the blog is useful to you. This does not seem to work in CIVIL 3D 2013. I can create new MLeader with boxes but cannot modify existing MLeaders to add a box. Am I doing something wrong? if pdf file converted in dwg. then how is take dimension in correct form mm or m.? You would need to scale the converted file by referencing a known length or dimension. Is it possible to control the linetype on the frame text box, e.g. make the line continuous around the text when the layer containing the leader has a dashed linetype ? Thanks for the reply. I have been trying to do this for a while now, and that is how I came across your tips page. I will have to persevere with changing the text box linetype under Multileader/ General/ Properties which does the job. 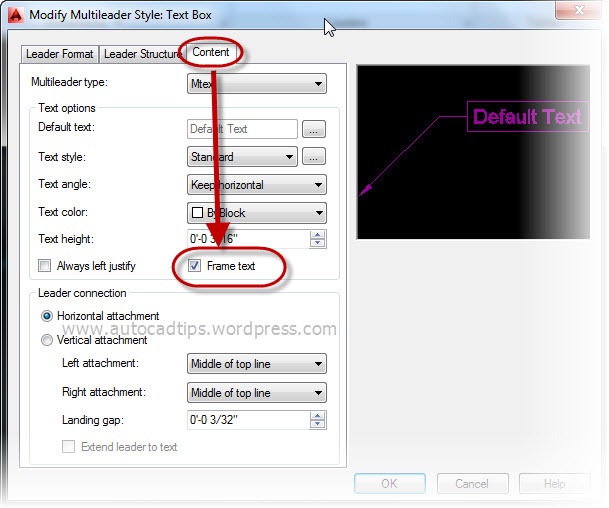 I dont suppose it would be too difficult for AutoDESK to include an option in the Multileader Style Manager to set the default (General) linetype… but I don’t know how to go about requesting features in AutoCAD. How about making it an oval instead of a rectangle? One that adjusts with the text like the rectangular frame does. I tried the slot block and can’t figure it out. Thanks! I make on cad 2010 . Useless! background mask bigger, but text frame not change. @colombus -adjust the grips of your text to keep the frame and background mask tight. Works a treat !! Thanks for help. This is very informative article. And a very well experience in you.